Learning how to saute mushrooms is easy. Sauter means "to jump" in French, referring here to the action of flipping food in the air while cooking. With a little practice you can be flipping mushrooms like a chef in no time! A saute is performed by cooking food quickly at high heat with a little fat. Just a little. I like to use between two and three tablespoons of oil (one that will tolerate heat). Anymore than that and you're technically frying, not sautéing. If you try to saute mushrooms that are too wet you'll end up with a soggy stew. For this reason it's best to just wipe purchased mushrooms down with a damp cloth and not rinse them. However, if you picked them in the wild you may want to rinse them off and pat them dry. Some cookbooks will tell you not to do this but I feel it's sometimes necessary with wild mushrooms. Use your discretion depending on how dirty they look and where you found them. Recommended mushrooms: All of them! Any edible fungus can make a sautéed mushroom recipe. Heat the oil in a low-sided saucepan or skillet. Use medium-high heat as the highest setting may burn your oil and ruin the recipe. Spread the oil around by moving the pan. Add the minced garlic and saute for 1 to 2 minutes. Add the mushrooms and cook until they are hot and have turned a darker brown color. Move them around with a wooden spatula once one side seems done. This usually takes around 5 minutes. Be mindful not to overcook! Be careful not to overcrowd the pan, as in the picture to the right. Too many mushrooms and they'll just stew in their own juices. This results in a soggy saute with less flavor. If you have a lot of mushrooms to cook, do them in several small batches instead of one big batch. Add salt if your diet allows. Salt will draw out moisture while cooking so be sure to add it at the end. 1/2 cup of onions, shallots, chives, or scallions gives great flavor. Two tablespoons of lemon juice or dry white wine are another good addition. Include herbs of your choice (rosemary, thyme, etc). A few red pepper flakes can really heat things up! You can also perform something called a dry saute. This is the process of sauteing the ingredients without any oil. 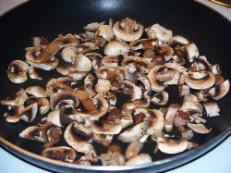 Simply add your mushrooms to the heated skillet and cook until brown. Why would you want to dry saute? Some people prefer a more "roasted" flavor without any oil. Some prefer a meal with a lower fat content. Others feel that a sauteed mushroom recipe with oil is still too wet, since mushrooms give off a lot of liquid while cooking to begin with. This is a great way to store wild mushrooms as well. After dry sauteing, put them in the freezer where they'll keep for a while. Now that you know how to saute mushrooms, are you feeling brave enough to try the "jump"? Just remember, if you're going to start flipping your food while cooking, make sure you know who's watching and how clean your floor is! If you're looking for more mushroom recipes check out The Complete Mushroom Book: Savory Recipes for Wild and Cultivated Varieties .